Greg is an experienced trial attorney who has arbitrated cases and tried jury and non-jury cases in state and federal court and represented clients in the Missouri and Illinois appellate courts and the U.S. Court of Appeals. Greg Mollett is a commercial litigator and the head of the firm’s real estate litigation and environmental litigation groups. Commercial litigation: Greg has counseled franchisors and franchisees in forming, structuring, negotiating and implementing franchise relationships. 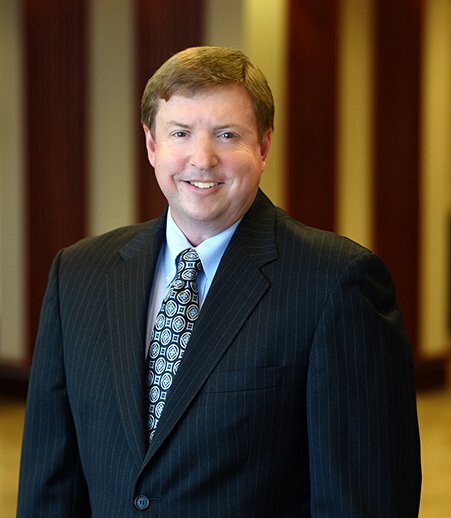 As a litigator, Greg has represented both franchisors and franchisees in arbitrations as well as state and federal court litigation. He has represented businesses in complex tort, contract, breach of fiduciary duty, tortious interference, non-competition, restrictive covenant, licensing, UCC sales, Magnuson-Moss warranty claims, stock transfer disputes, asset sale disputes and shareholder litigation. He has represented small start-up companies, regional companies and Fortune 250 corporations. His commercial practice is regional in scope, and he has brought and defended suits in Missouri, Illinois, Indiana, Arkansas, Kansas and Iowa. As a former insurance professional, Greg has extensive professional experience in insurance coverage, fraud, bad faith and vexatious refusal matters. He has represented insurance carriers, insured parties, agents and brokers and has handled fraud, negligent misrepresentation, breach of contract and negligence cases. Greg also holds the CPCU designation, earned from the American Institute of Chartered Property Casualty Underwriters in 1995. In addition to litigating cases, he advises business clients on general business and commercial law. Greg has an MBA and has lectured on business law at the University of Illinois. Real estate: Greg represents and counsels real estate developers, property owners, tenants, brokers and property managers. He has litigated condemnation, inverse condemnation, partition, purchase and sale, title defect, quiet title, contract for deed, adverse possession, prescriptive easement, strict way of necessity, foreclosure, lien and residential and commercial landlord/tenant cases such as rent and possession, unlawful detainer and forcible entry and detainer. Environmental: Greg has extensive experience in CERCLA and RCRA litigation and private party liability allocation. He has negotiated Administrative Orders on Consent and response to Unilateral Administrative Orders. His environmental practice has included representation of small and medium-size companies, not-for-profit corporations and large industrial and commercial clients such as those in the petroleum refining, secondary aluminum and primary zinc manufacturing industries. Greg has investigated and brought claims for underground storage tank liability and has experience defending clients from environmental and toxic tort allegations, such as environmental nuisance, environmental trespass, negligence, strict liability and medical monitoring. He has coordinated emergency response for environmental releases to the air, soil, surface water, ground water and navigable waters. He counsels with regard to spill reporting, hazardous waste releases, stop work orders, compliance response plans and evidence preservation. Greg has represented clients before regulatory and enforcement bodies and has responded to Notices of Violation in Missouri, Illinois, California, Utah, Indiana, Alabama and Pennsylvania as well as responding to investigations by the Missouri DNR, Massachusetts DEP, Illinois Department of Natural Resources, Indiana Department of Environmental Management and EPA Regions 5, 7 and 9. He assists national and regional companies recognize, treat and respond to the risks and exposures arising under California Proposition 65. Greg has counseled clients and resolved environmental disputes arising from contamination connected with Concentrated Animal Feeding Operations and coal mining under the Surface Mining and Reclamation Act and the Illinois Surface Coal Mining Land Conservation and Reclamation Act. He has experience with the Federal Clean Air Act and Clean Water Act as well as enforcement proceedings under each. In addition to litigating liability issues, Greg has advised clients regarding criminal penalties, civil penalties and debarment. Greg has served as outside environmental counsel to an international company with environmental exposures in all 50 states, Europe and Asia. "Real Estate, Construction and Asbestos"
"Environmental and Regulatory Aspects of Asbestos in Commercial Real Estate"
"Advanced Issues in Real Estate Law"
"Types of Real Estate Litigation"
"Ethical Responsibilities in Environmental Matters"
"Real Estate Litigation in Missouri"
"Litigation of Real Estate Cases"